Buying cookware is the final stage of entry to adulthood, right? I’ve been using the cookware pictured here for about 16 years. Liberated from the home of my dearly departed paternal grandmother, it’s likely older than I am. Wear and tear wasn’t really a problem, however, since she hardly ever cooked much more than a can of chicken noodle soup. It was some kind of enamelware, with hints of an Australian origin. I was always sort of vaguely aware that I should buy something “real,” since who knows what that stuff was coated with. One of the larger pots developed a small dark spot on the bottom in the late ’90s. While boiling water one day, I watched the spot rise to the surface, followed by a powdery, brownish red cloud. It seemed to have rusted through from the inside out. Other than that incident, it was incredibly durable. The only reason I had to get rid of it was because of another very grownup purchase my husband and I made recently: a new stove. It’s a stainless steel model with a ceramic cooktop that, in theory, will make the kitchen sleek and sporty once we’ve replaced everything else that makes the kitchen non-sleek and frumpy. The only caveat: The safest way to use the ceramic cooktop is not to use it at all. It is the drama queen of cooking surfaces. No enamel. No cast iron. No aluminum. Only the flattest of flat-bottomed cookware will do. No hint of moisture on the outside of the vessel. If you spill anything with sugar in it on the cooktop, immediately turn the stove off, call a priest and get him to pray that you can remove the spill before it makes a pit on the surface. I kid. Sort of. It’s actually a really reliable cooktop, once you get used to it, and the oven is the most accurate model I’ve ever used. And it does make one end of the kitchen look very sporty. I think I’m even burning extra calories, because cooking without the fear of instantaneously destroying your cooktop doesn’t produce any adrenaline at all. It might all be hype. Several people have told me that they use anything and everything on their ceramic cooktops. But older enamelware seems to be a consistent no-no – the surface coating has every possibility of actually melting onto the cooktop. So we bought a set of stainless steel, the only “sure thing” to use. I was pleasantly surprised by the price; my husband found a five-piece set of Tramontina, recommended by Cook’s Illustrated, for around $150 at Wal-Mart, a real bargain compared to most of the luxury brands. I’ve got no complaints about it. 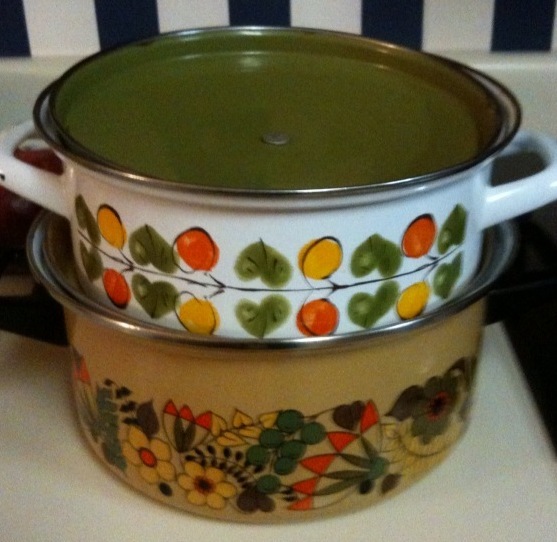 Best of all, some lucky thrift-store scavenger is going to get a few more years of use out of my grandmotherly enamelware. Just beware the small dark spot on the bottom.